The Plantation Road Project Phase I Ribbon Cutting was held on October 31, 2018 and featured staff in Wizard of Oz costumes with candy for trick or treaters. 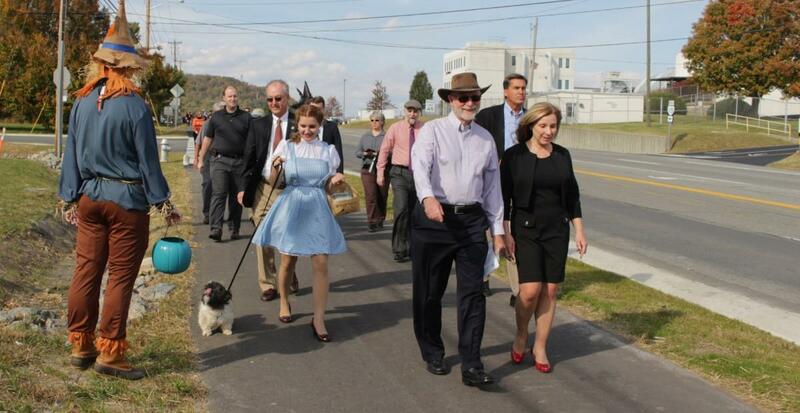 The Plantation Road Bicycle, Pedestrian and Streetscape Improvement project (Plantation Road Project) encompasses the length of Plantation Road (Route 115) from Interstate 81 to Williamson Road (Route 11), a distance of about one mile. Proposed improvements include sidewalks, shared use paths, pedestrian crosswalks and signals, street trees, pedestrian-scaled lighting, a Hollins community identification sign, landscaping and drainage improvements. One of the primary goals of constructing the shared use paths is to connect Walrond Park with the Tinker Creek Greenway which then intersects with an extensive network of trails at Carvins Cove Natural Reserve. Underground and overhead utility relocations. Reconstruction of about 420 feet of Lila Drive to the new Harris entrance. The project is currently in the Right of Way phase with construction advertisement anticipated in Fiscal Year 2020. Pedestrian signals at the Gander Way/Friendship Lane intersection. Preliminary Engineering will be underway shortly and construction is anticipated in Fiscal Year 2021. October 31, 2018: A Ribbon Cutting Ceremony and Walk for Phase One was held at BSC Ventures/Double Envelope. View the photo gallery. August 28, 2018: After being improved to meet VDOT standards, Lila Drive was turned over to VDOT as a public road. Subscribe to electronic updates on Plantation Road projects. Contact Megan Cronise, Principal Planner, by email or by phone at (540)772-2106.